In September 1912 a respected country lawyer by the name of Charles Dawson made a discovery that shocked science. He said that he had found a prehistoric humanoid skull in a gravel pit near Piltdown Common, Sussex, in southern England. Dawson had been told that there were some valuable geological artefacts to be found and spent days burrowing in the pit. At first he found fossilized bone fragments then flint tools, fossilized teeth, and finally, the skull. He sent his findings to his friend, Dr Arthur Smith Woodward, of the British Museum. Woodward opened the package and was so excited that he rushed down to join his friend at the dig. The skull was final proof of Charles Darwin’s 1859 Theory of Evolution. The two men sifted through the gravel and unearthed more finds. More experts were called in and they all agreed that Piltdown Man was the proof of the missing link between ape and man. The skull had an ape-like jaw and tiny brain area, but its teeth were worn down, the way that human teeth erode. The find was announced on 18 December 1912. 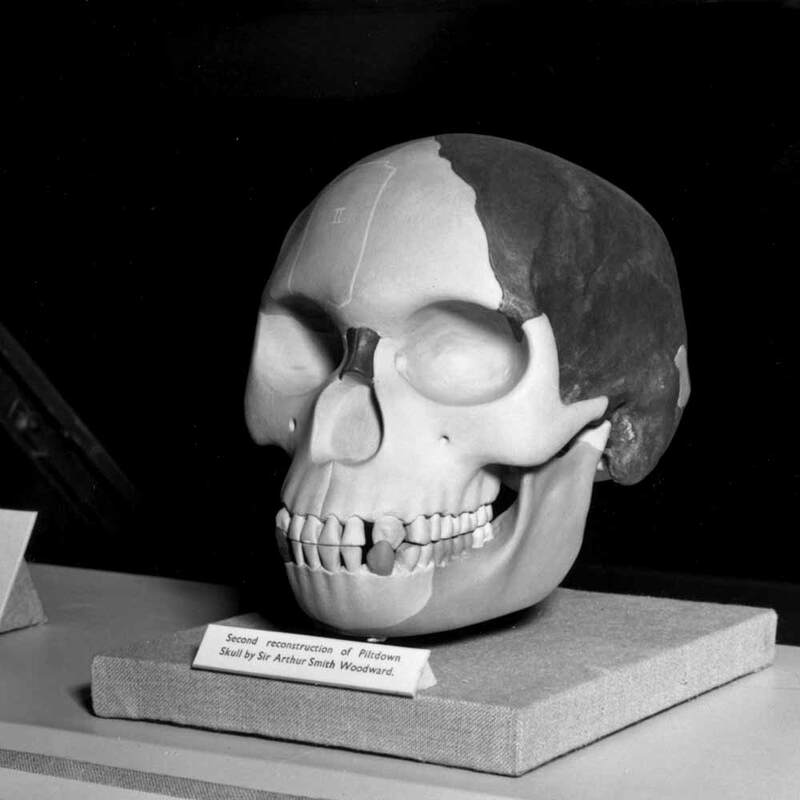 Woodward meticulously built a full head from the skull and fragments and named the find Evanthropus dawsoni — Dawson’s Early Man. He said it was 500,000 years old. Geologists wanted Piltdown to be granted National Monument status. Dawson became a geological hero; Woodward wrote a book on the find and the British Museum displayed the skull. The local pub in Sussex changed its name from The Lamb to The Piltdown Man and the area became a popular tourist destination. Dawson continued to excavate the area and began building a second skull from his finds. Dawson died aged 52 in August 1916 and no further objects were found at Piltdown. A number of sceptics doubted the authenticity of Piltdown Man and they were right. No one, however, was allowed to test the skull until 1949 when Dr Kenneth Oakley, one of Woodward’s successors, carried out tests. 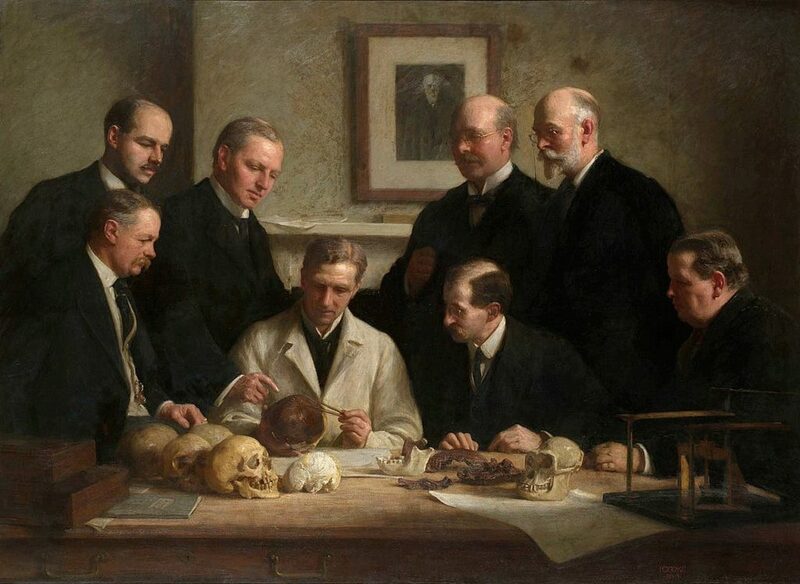 Group portrait of the Piltdown skull being examined. He pronounced that the skull was not half a million years old but only 50,000. He was wrong. In November 1953 a group of palaeontologists tested the skull and pronounced it a fake. The skull was indeed man but the teeth and jawbone came from an orang-utan whose teeth had been filed down. The skull had been stained to age it, then broken up and buried at Piltdown. No one knows for certain who the forger was. The prime suspect is Charles Dawson but some suspect Sir Arthur Conan Doyle, the creator of Sherlock Holmes.